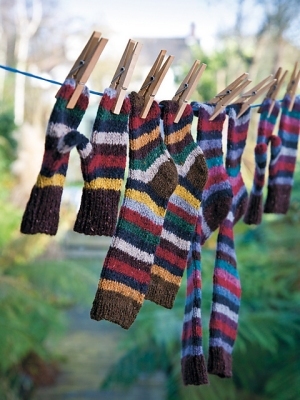 Taken from Little Aran & Celtic Knits For Kids: "Knit these childrens accessory striped socks from Aran & Celtic Knits for Kids. A design by Martin Storey using the gorgeous yarn Felted Tweed DK, these socks are knitted top down on double-pointed needles." This pattern is from Little Aran & Celtic Knits For Kids, pg 84 - Olle Socks. Size US 3 double point needles, US 5 straight needles (or size needed to obtain gauge), and stitch holders are required but not included. Finished Measurements: 1-2 (2-3, 3-4) after blocking. Gauge: 24 sts and 30 rows over 4".